From the very first day of the 2020 presidential race, when Senator Elizabeth Warren of Massachusetts blamed generations of discrimination for black families earning far less than white households, Democratic hopefuls have broadly emphasized racial justice and closing the wealth gap in their policy platforms. Last week, Senator Kamala Harris of California agreed with a radio hosts recent suggestion that government reparations for black Americans were necessary to address the legacies of slavery and discrimination. Ms. Harris later affirmed that support in a statement to The Times. Ms. Warren also said she supported reparations for black Americans impacted by slavery - a policy that experts say could cost several trillion dollars, and one that Barack Obama, Hillary Clinton, Bernie Sanders and many top Democrats have not supported. Other Democratic 2020 candidates  including Mr. Booker, Ms. Gillibrand, Senator Amy Klobuchar of Minnesota and Julián Castro  either did not respond to requests for comment or stopped short of an endorsement of reparations. Instead, several laid out policies that, though not intended as a redress for slavery, would benefit black Americans. These silly issues are to get the nomination. If they continued with stuff like this in the general they’d get killed. The United States already payed the slaves with their lives during the Civil War! This is not news; it’s what they’re about. "I dream of a day when a man is judged by the content of his character and not the color of his skin." I always wonder, what more is supposed to happen, as far as the legacy of discrimination and all that? The Civil Rights Act of 1964 was passed over 50 years ago. A few generations of blacks have grown up in an era of full equal rights under the law. We have aggressively instituted policies such as affirmative action, to try to redress problems of the past. Affirmative action has been around for decades. Some people say how our schools are as segregated as ever. However, that is due mostly to housing patterns, not due to legal discrimination. But in most cases, the most segregated schools are located in cities which have been run by Democrats, often black Democrats, for decades. And these schools often have black principals, black teachers, and black members of Boards of Education administering the schools. So if education is not up to par in those schools, we know it’s not due to racism or discrimination. These silly issues are to get the nomination. If they continued with stuff like this in the general theyd get killed. How can you walk back a thing like that? Trump won't let them. He'll be tweeting it every day. 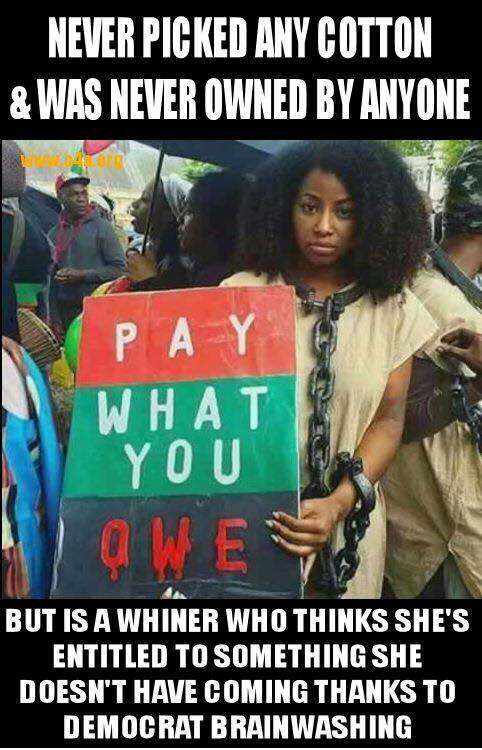 Only Democrats should pay reparations and they should pay them to all non-democrats because the Republicans paid in blood to free the slaves from the democrats. Just because giving blacks free stuff worked in the past, it doesn’t mean it will work this time. They are wise to that. Well, a lot of the blacks that vote are. I just added up the number of deaths caused by all the wars in our history - 1,302,254. Compare that number to the number of babies aborted each year which fluctuates between 900,000 and something over 1,000,000. So, this country alone kills about as many people as have been killed in all our wars in out entire history as a nation - per year. Yes, let’s eliminate all of the GENOCIDAL abortion jobs. Victim (21 y.o. guy from Santa Monica studying political economy at UC Berkely) was at a promo booth for Turning Point USA. His sign said, "Hate Crime Hoaxes Hurt Real Victims" and "This is MAGA Country". Crazy lefty guy accosts victim, cussing him out, PUNCHES HIM IN THE FACE..! 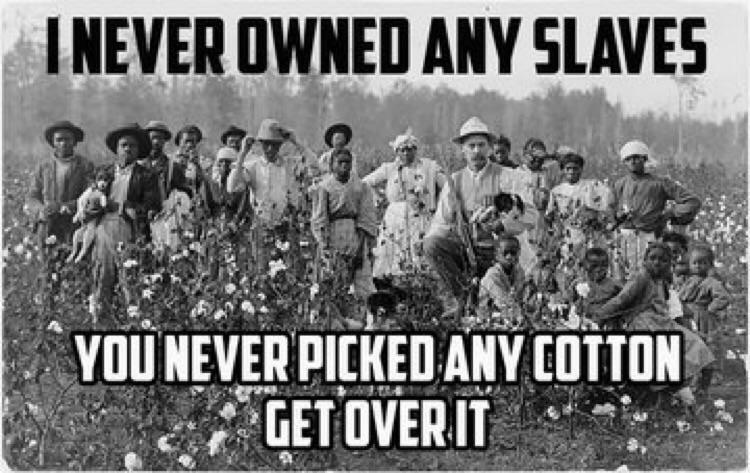 I never owned no slaves and you never picked no cotton. 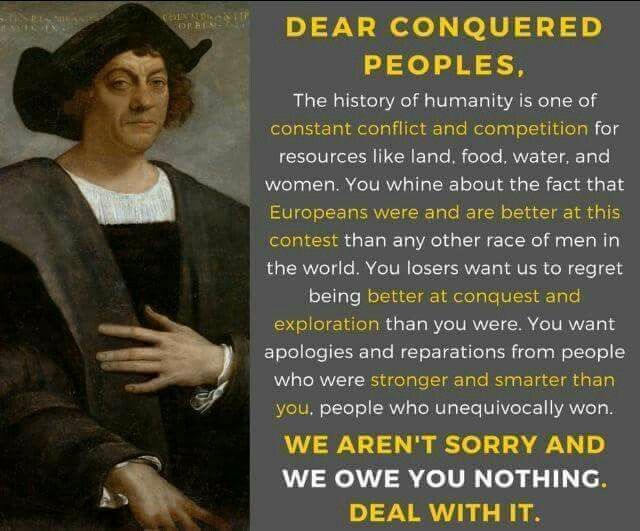 More than 600,000 dead, mostly whites. Economic devastation forcing a huge proportion of the widows into prostitution and their orphaned children into child labor under horrifying conditions. 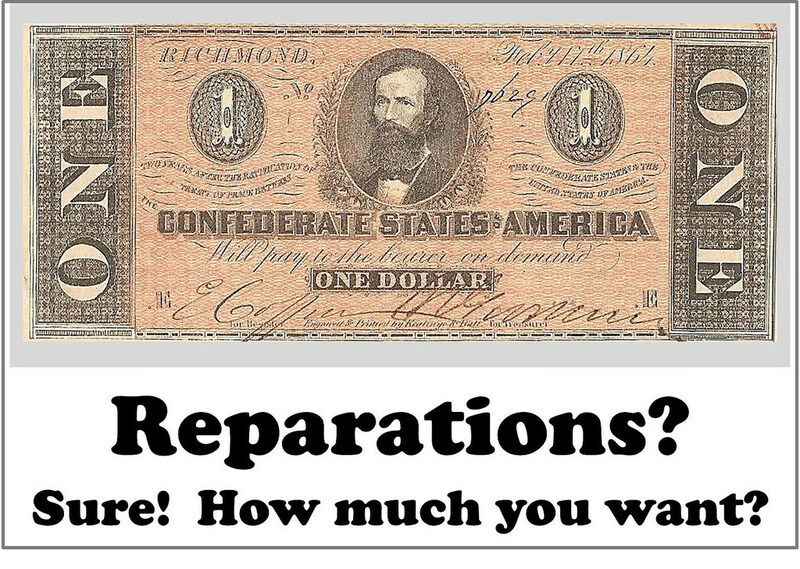 Reparations continuing post Civil War with direct payments to former slaves, in land and goods, accompanied by massive wanton destruction of property of former slave holders and others by Union army. More reparations through a welfare system that paid men not to work, and women to have babies out of wedlock. PAID IN FULL. Why tax people who never held slaves to pay people who were never slaves? Because criminals want money that isn’t theirs. 1. The Democratic party is the party of slavery. 2. Abolish the Democratic Party, sell all of its assets. 3. Pay reparations to people who can prove they were slaves. This concept is truly beyond absurd. This country paid its debt to the slaves in blood, the blood of Union soldiers. The United States of America was the first country in history to ever care about freeing slaves and then we actually fought a war to make it happen. Slavery has been around since soon after man’s fall from grace; there are references to slavery in Genesis. Should we “make reparations” for all the slaves that ever were throughout history? Also - myself for example - what about those of us whose ancestors legally immigrated well after the civil war? My ancestors were from Switzerland and they arrived after the civil war, they had nothing to do with slavery in this country. Only southern democrats were responsible - try going after their descendants and leave the rest of us alone. The hatred for Whites is increasing. This is proof. So is jussie smallett. They are obsessed with beating Whites down into submission until they become whimpering, sobbing wusses who willingly accept whatever the left does to us. The end goal is eliminating Whites, after taking all their money. THEY ARE ALL DEAD, YOU DUMB $#^@*@!!! Does Warren gargle with hot sauce?